Here is another page of data, respecting just one of the passengers (but now see lower down on this page re that matter) of the Volturno, one Walter Trentepohl, a German, who feared for his life if he stayed one minute longer aboard the burning vessel. That is Walter at left, in a scan of the Spurgeon book image kindly provided to me by Tony Jones. He was apparently a strong swimmer, and did he ever prove that! He jumped - into the raging seas and in darkness - and amazingly he survived. The ship, which he hoped to reach, the Grosser Kurf�rst, then in close vicinity to the Volturno, never even heard or saw him, it would appear. He was about an hour in the water and was heard and then spotted in the high seas by the roving searchlight of the Carmania; and rescued in a totally exhausted indeed semi-conscious state. We even have a painting of the rescue! The Carmania, it would seem, was the only rescue ship equipped with a searchlight. Now I, for one, would like to know what happened to him later on in life. He was, I read, in the employ of a firm of merchants in Barcelona, Spain, and was aboard the Volturno travelling to take up a new position in New York City. He ended up, alive, in Liverpool, England, where he probably stayed a while in an infirmary until he recovered. Then? Did he take new passage to the United States and take up his position in New York City? I sure would like to know. Does anybody know? If so, do please tell me, so his story can be completed in these pages. 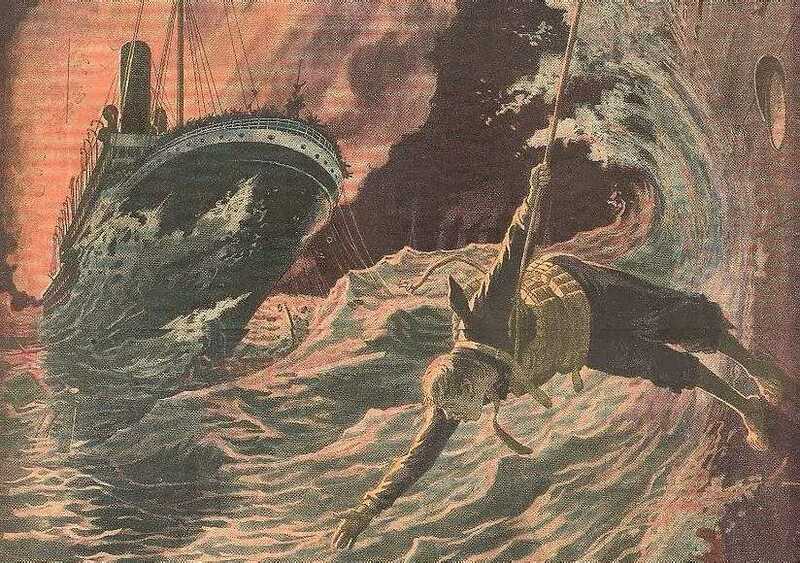 The rescue of Walter Trentepohl, took place very late in the evening of Thursday, Oct. 9, 1913. Probably he was brought aboard Carmania at about 11 p.m. that night after he had been in the water for about an hour. Much of Walter's Volturno story is already on site, within the text of Arthur Spurgeon's book on pages 2 and 3 of this site. But, thanks to Raymond Brown, I am able to provide you, in the large block of text below, with a very complete report of his experiences as they were reported in the Liverpool Echo, of Monday, Oct. 13, 1913. The spelling of his name is a bit confusing. Arthur Spurgeon named him Trentepohl, (with an e) in his book, written long after the event and absent the crisis of an urgent wireless dispatch. The article below, attributed largely to Arthur Spurgeon from a telegraph message, names him Trintepohl (with an i). No matter! The book spelling may be more likely to be the correct spelling. Even more confusing to the webmaster is his status. As the site advances, more and more specific data is read and assimilated. The testimony given at the London Board of Trade Inquiry into the whole matter, as was published in the London Times, is very detailed indeed. Amongst those who testified was Mr. R. B. Tinsley, manager at Rotterdam for the Uranium Steamship Company. His testimony on site page 17 is most specific and he would surely have had unique access to all of the relevant facts. He lists the numbers of passenger survivors rescued by each of the many rescue vessels, numbers which jive in all cases except two (Carmania and La Touraine) with the data I have accumulated on page 19 of this site. And Carmania with its one passenger rescued is NOT listed by Tinsley. Why not? Is it possible that in the time after the various reports were filed at the time of the disaster, including that of Arthur Spurgeon, that Trentepohl was found to be NOT a passenger who was a clerk en route to a job in the U.S? Could he instead have been a crew member of Volturno? A matter upon which Mr. Tinsley seems not to have reported. Such a mistake might well have been made in the pressure of the moment and with the difficulties of language. Data lower on this page really does not help, since it all originated with Arthur Spurgeon. I pose the question, or maybe speculation would be a better word, but today I do not have a satisfactory answer for that testimony of Mr. Tinsley at the Board of Trade Inquiry. Can anybody help? It is now clear that Mr. Tinsley had it right and Arthur Spurgeon had it quite wrong, if, that is, one can accept the Board of Trade Report to be fully accurate. That report is most exact in a thousand particulars. And personally, having now read it's detail and descriptions, I accept it as being prepared with great care and being word perfect. The Report states that the Carmania rescued but one person, which we knew, but that that one person was a crew member. So he was a Volturno crew member and not a Volturno passenger. Which seems to me to conform with the words of K. Funken or Funben at the bottom of this page. Such words could only have been written about a fellow crew member. Now Trentepohl does not seem to be a particularly common name. There was a Walter Trentepohl who arrived in New York on Jul. 31, 1909 aboard the Kaiserin Auguste Victoria ex Hamburg (line 5 on manifest pages here and here). He was a German from Strassburg, 23 years of age and married, and described as being a merchant. En route then to a brother in Mexico, I believe. Is it possible that this is the same Walter Trentepohl? I can so far find no references on Ellis Island to any immigrant named Tristenpohl. It may be that the 1909 listing IS the same Walter Trentepohl and that he became a U.S. citizen after 1909 and would not then be listed as immigrating in 1913. But his being described as being a German and speaking broken English would be then a bit inconsistent. I have found no age references to the Volturno survivor yet, but he surely is quite young. 1) Per the Liverpool Echo (exact date not known) and re events at 9:30 p.m. on Oct. 9, 1913. 'Soon after this cries for help were heard near the Carmania and one man, a steerage passenger, with a life belt on, was picked up by the aid of the searchlight, and only after a sailor had gone into the water with a life-line could the poor fellow be got on board. "When alongside, Chief Officer Johnstone and First Officer Gardner descended ladders with lifelines, but on account of the sea and the exhausted state of the man the rescue was not effected until Heighway, A.B., dived in with a lifeline and tied another around the man. Even then the rescue was effected with difficulty." 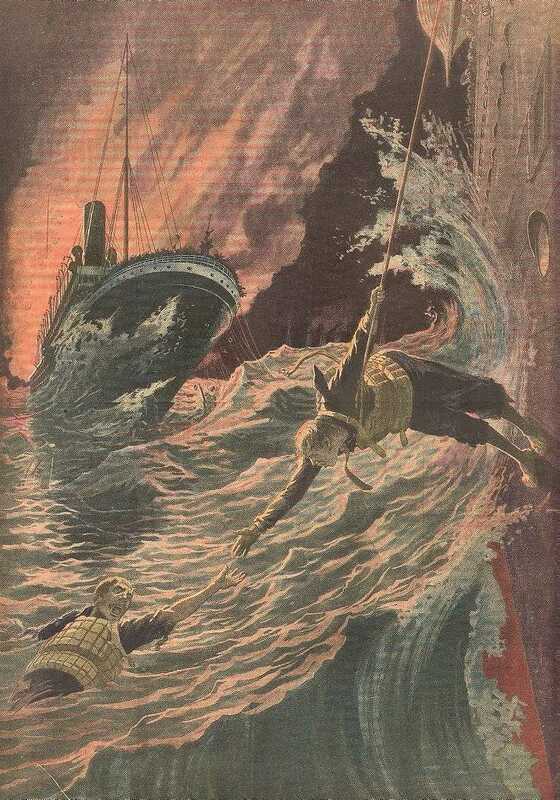 And here I am so happy to show you an image that surely depicts Seaman Edward John Heighway of the Carmania on a life line rescuing Walter Trentepohl from the clutches of the sea. The artist may be forgiven a bit of artistic licence in depicting the Carmania, which would be the vessel at right, being so very close to the Volturno. For legitimate reasons, the Carmania, a comparative giant of a vessel, dare not get so very close to the Volturno in the sea conditions for risk of a collision. But none the less, the image is very fine indeed. It comes from the back page of the Oct. 26, 1913 edition of the French newspaper "Le Petit Journal". I show you, in the first image, almost the full work and a superb detail from that work with Walter trying to grasp Heighway's outstretched arm of rescue. And then (below) another fine detail of the work. The best image I have of the entire painting can be seen here, but it is very big indeed - so be warned! More detail as to the image and where I found it is on page 27 hereof. Now the black and white image of Walter Trentepohl, at the top of this page, comes from Arthur Spurgeon's book. 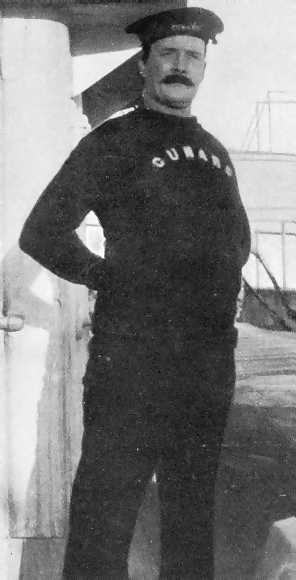 Also included in that book, was a picture of Seaman Heighway, who stands bolt upright in his picture, sturdy and proud wearing a Cunard sweater - presumably taken aboard the Carmania. It is fitting that Seaman Heighway join Walter today through the medium of this page. And Tony Jones has kindly provided a scan of portion of the image in the Spurgeon book. I present it, however, along with the words that were used respecting the award to Edward J. Heighway of the Honorary Silver Medal of "The Royal Humane Society" (Case 40,567). Also courtesy of Tony Jones. 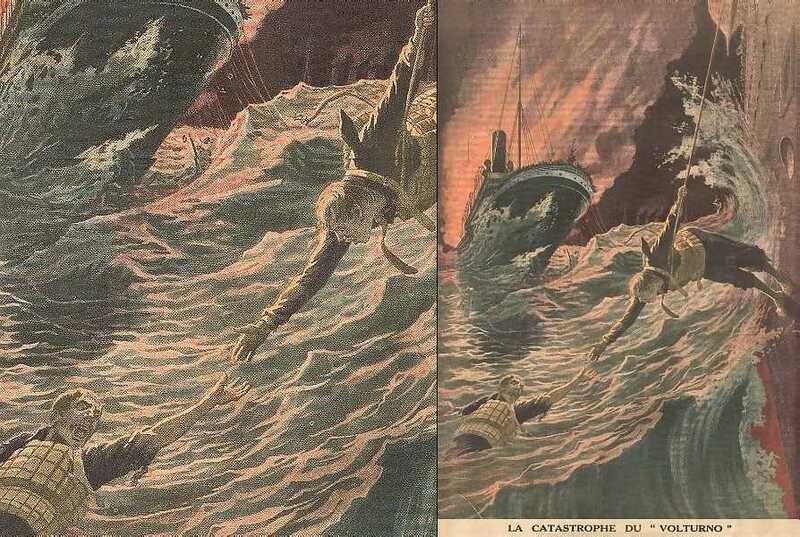 "At 11 p.m. on the 9th October, 1913, the s.s. "Volturno" was on fire in the Atlantic, and a number of vessels were standing by for the purpose of saving life, among them being the s.s. "Carmania," of the Cunard Line. About 11 p.m. a cry was heard from the darkness, and on the searchlight being turned in the direction of the sound a man was observed struggling in the water on the starboard bow. An endeavour was made by manoeuvring the ship to bring the man alongside, and lines were thrown, which were of no avail. 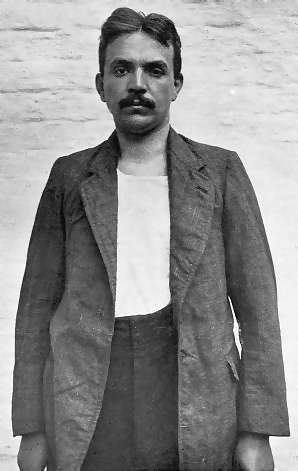 Edward J. Heighway, seaman, then threw off his cloths and lowered himself into the sea from the �B� deck, letting go of the line. He swam out and, getting hold of the man, succeeded in bringing him to the lower door amidships. After considerable buffeting against the ship�s side he managed to secure a line which was thrown, and both were safely got on board. There was a fresh gale blowing, with a heavy sea and swell, so that great risk was incurred. The Silver Medal was voted to Edward Heighway." "The most connected statement as to what took place on the Volturno is made by a passenger who swam to the Carmania and was rescued in an exhausted condition. Since his rescue he has been in the ship's hospital, and for a time he was threatened with pneumonia. On reaching Liverpool, he will be taken to an infirmary. Before he became ill he told me his story. His name is Walter Trintepohl. He is a German, and has been in the employ of a firm of merchants at Barcelona. Having had the offer of a position in New York, he took a third-class passage in the ill-fated Volturno. His story was told somewhat incoherently, and he speaks broken English. This is what he said. "We sailed from Rotterdam on Thursday October 2nd, and all went well until 6 o'clock the following Thursday morning, when the fire alarm was sounded. We were roused from our berths and told to go on deck, as a fire had broken out in the hold. As we assembled on deck lifebelts were handed around, and much time was occupied in fastening them. We were told that the fire might soon be put out, but the captain thought it wise for all passengers to put on lifebelts as a precaution. The fire much upset the children, who cried bitterly. There were many babies in arms. The fire grew worse, and we saw things burning down below. About ten o'clock there was a cry to put out boats. The captain behaved splendidly as did the officers, who were English. I am sorry to say that the crew, who were Germans and Belgians behaved very badly. People rushed about wildly, and the crew seemed to think they ought to have first place and instead of quieting them they made the panic worse. The first officer took charge of the first boat, but although he wanted the women and children to be saved first, the majority of those on that boat were members of the crew. They lowered a boat, and just as it reached the water, it smashed against the ship's side. The boat broke in two and all were drowned. Meanwhile others of the crew were attempting to launch a second boat. I cannot say who was in charge, but I do know that after the chief steward had thrown some provisions into the boat he jumped in himself. There were more men than women and children in this boat. There was a big sea running. The boat did not go down far when it was broken against the ship's side and all were drowned. These two boats were amidships. Three other boats were put out which were aft. The fourth officer was in one of them, but I cannot say which. All was confusion. The ropes broke, and the occupants were thrown into the water and drowned or killed. We were so glad when we saw the Carmania come, for we said, "Now we shall be saved." When the firemen rushed up from below and they refused to go back, the captain got out his revolver and drove them below; but not long after, as the fire was spreading, they had to give up working the engines. As soon as the Carmania came in sight the captain made all the women and children go to one side and the men on the other side. He had been compelled to leave the bridge and go aft, because it was too hot. The women wept and shrieked and laughed, and became hysterical. We had no thought of food, but in the afternoon we considered we had better get something and we went into the kitchen. Nobody was there, so we made some coffee and helped ourselves to some biscuits and pickled beef. But most of the passengers refused to eat anything. We saw rafts sent by the Carmania, but nobody told us to jump. In fact we did not know what they were for. About six o'clock the decks aft began to get very warm. They got hotter and hotter, but we did not seem to feel the heat. I do not remember this, but it was awful when the flames burst out. Some women and some men tore their hair, but others were quite still. After the explosion I thought it better to make a jump for I am a good swimmer. An English passenger and a member of the crew said they would come with me. I jumped first and they followed, but I never saw them again. I made for the German ship but they did not hear me. Then I came towards the Carmania. I shouted "Help, help," and then I was seen by a searchlight. I was about an hour in the water and I became half-unconscious. I do not know how I was got out. During the day five sailors and one steward fell into the fire and were burned to death. I do not know anything else. I came away because it was too hot to stay any longer, and I thought the whole ship would blow up. It is not so. I was there all the time and saw everything. No boat got away. When the captain saw what had happened he cut the tackle off the other boats so they could not be launched. Elsewhere in these pages, (re the Czar), I have referred to the words attributed to K. Funken or Funben, a 26 year old storekeeper with the Volturno. He was one of the very last to leave the Volturno, and left with Captain Inch, the ship's documents and the dog. The words were provided to the webmaster from the DeGroot/Groeneveld family records by Melissa Groeneveld, whose family were aboard the Volturno and all survived. In the storekeeper's words is the following about 'Tristenpohl', as he spelled the name. If YOU have any new data about the Volturno, or in any way related to the Volturno, I would welcome your writing to me. And to the Special Pages Index.